Goa, the Beach Capital of India, is the single most popular honeymoon destination in India. not only newly weds from India, but also from abroad choose Goa for their honeymoon. The highlight of Honeymoon in Goa is a healthy fusion of tradition and modernity, heritage monuments and modern construction and typical Goan and International cuisine. whether you love nature, adventure or history, Honeymoon in Goa offers you tremendous opportunity to indulge in all this and much more. A good connectivity with Indian and international cities also favors for Goa as a honeymoon destination. Good hotels with world-class amenities facing the mesmerizing beaches are the bonus of Honeymoon in Goa. 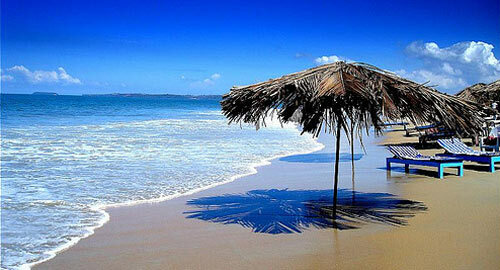 The beaches of Goa are the first place to throng on Honeymoon in Goa. The long and clear beaches are lovely places to spend some time with your life partner. Some of the beaches are crowded while others are comparatively lonely and calm. The major beaches of Goa are the Agonda, Aguada, Anjuna, Arambol, Baga, Benaulim, Bogmolo, Calangute, Candolim, Cavelossim, Colva, Dona Paula, Mabor, Majorda, Miramar, Palolem, Sinquerim, Vagator and Varca Beach.